ABCNews 2 reports that Baltimore's speed cameras issued a total of 379,237 citations in their first twelve months, worth a total of $15.2million. Baltimore had originally written $7.1million in net revenue into their FY10 budget, an amount proposed before the any camera sites were selected and only a few days after the speed camera law was approved by the state legislature. The 12 month period these citations were issued in would covers part of FY11 as well, the $7.1million figure was a 9-month estimate based on paying their contractor a share of this revenue. The $15 million, assuming all citations were paid, would be divided between the city and their contractor(ACS). 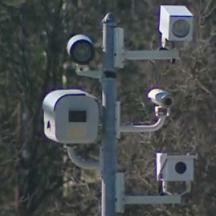 Baltimore designated a vast number of new 'school zones' to permit these cameras, a fact admitted to by the Baltimore Department of Transportation last year. Areas eligible for "school zone" cameras now cover over 80% of the city, including locations which are not adjacent to any school and even locations where schools have been shut down. It is unclear whether this 379,237 ticket total includes the over 900 citations which one Baltimore camera issued in error earlier this year when it was configured to the wrong speed limit.